Franklin is depicted in the role of a scholar or thinker, seated at a table covered in red cloth, with a sheaf of papers in his left hand, which he reads attentively. His appearance of concentration is emphasized by the knitting of his brows, the set of his jaw, and the manner in which his head leans on his right thumb, a posture that contemporaries called characteristic of him. Behind him and on the table are leather-bound volumes. Facing him, shown in profile and gazing down on him, is a representation of the baroque sculptor Louis François Roubiliac's bust of Isaac Newton: Franklin's name was linked with Newton's during his lifetime. 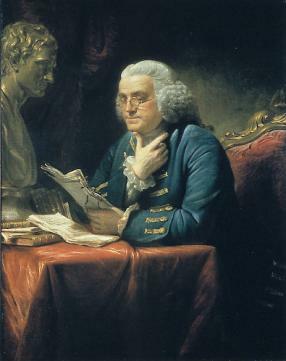 Franklin wears a blue coat with gilt tape and gold buttons, a white wig, and spectacles. This earliest of the several portraits by or after Martin differs slightly in the appearance of the chair in which Franklin sits. An open armchair, it is depicted as having a slightly arched crest that is carved and gilded, and surmounted by an eagle. The painting was "repaired" by Philadelphia painter Thomas Birch for exhibition at the Pennsylvania Academy of the Fine Arts in 1814. The elaboration of the crest is believed to have been done after that date, since it does not appear in this version or in the earliest copy of the painting, which was done by Philadelphia painter James Reid Lambdin (1807-1819).